BlueGrace Logistics is your source for easy and efficient transportation management services. As a third-party logistics (3PL) company that specializes in freight shipping and logistics management, we can streamline your transportation operations to give your business in Los Angeles, CA, a competitive edge. At BlueGrace Logistics, we combine state-of-the-art technology with experienced professionals who are passionate about what they do to provide you with the best possible customer service and award-winning logistics management. Additionally, if you have any questions, one of our friendly and knowledgeable BlueShip experts is just a phone call away. 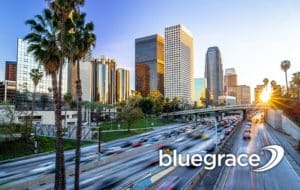 If you’re ready to see measureable improvements in your supply chain, contact BlueGrace Logistics today to learn more about how our transportation management services can benefit your business in or near the Los Angeles area.